Everybody has their favorite way of preparing mashed potatoes: with skin, without skin, with milk, without milk, with cream cheese or sour cream. The options are endless! 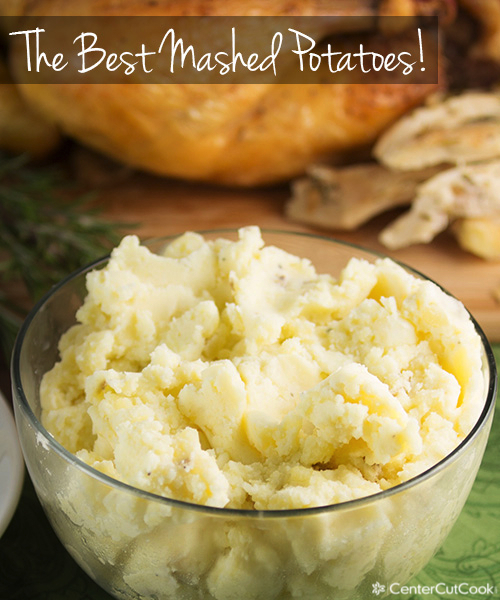 This combination of ingredients in this recipe results in The Best Mashed Potatoes! Mashed Potatoes are one of those recipes that everybody has their own version of. Growing up, my Mom made some of the most delicious mashed potatoes and only ever used milk, butter, salt and pepper. Over the years I have played around with all kinds of variations. Sometimes I make mashed potatoes with red potatoes and leave the skin on and include ingredients like cream cheese an garlic! Other times I want a more traditional version that’s perfect for serving alongside pot roast or Thanksgiving Day turkey! That’s the version I’m going to share with you today. I’m callin’ these guys the best because I haven’t come across a recipe I like better! It’s possible there’s a better one out there, but this is my fave. There are a few differences with this recipe compared to most standard mashed potato recipes. For starters, yukon gold potatoes are used in place of the standard russet. Instead of just milk and butter, these guys get a healthy dose of cream cheese, butter, sour cream, and just a little bit of milk to make them fluffy. Oh, and don’t let me forget to mention the garlic! I threw a couple of garlic cloves in with the potatoes while they were boiling and mashed them in with the potatoes. Add a little salt and pepper in and you’re done! The end result? Flavorful, cheesy, fluffy mashed potatoes that will perfectly compliment the Thanksgiving turkey! Yields enough potatoes to feed a crowd! Oh! 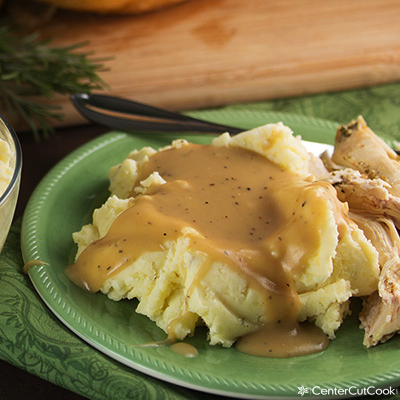 And don’t forget the Perfect Turkey Gravy – this recipe can be made with or without drippings! All you’ll need is butter, flour, black pper, chicken or turkey stock and/or drippings! In a large stock pot, arrange potatoes cut into 2 inch chunks. Add in 4 garlic cloves that have been peeled. Add enough water or chicken broth to cover the potatoes. Bring to a boil and cook for 20-30 minutes or until the potatoes are fork tender. Drain the liquid from the potatoes. Return the cooked potatoes and 4 garlic cloves to the pan. Add in butter, cream cheese, sour cream, salt, pepper, and garlic powder. Using a potato masher, mash, mash, mash the potatoes until most of the clumps are removed. Add in milk, up to 1/2 cup, and continue mashing until the potatoes are smooth and fluffy. Add more milk if desired. If you want ultra smooth potatoes, beat them with a hand or stand mixer until the desired consistency has been reached. 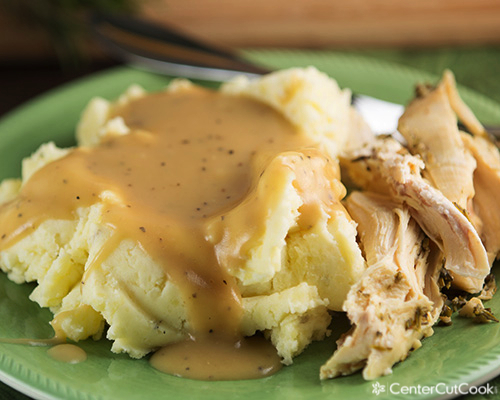 Serve with this Perfect Turkey Gravy if you’d like.